How classic would a cocktail need to be in order to have a whole day dedicated to it? And is a cocktail still the same cocktail if made with entirely different ingredients? Well if gin martini purists had a hard time accepting vodka martinis, it’s time to test the boundaries yet again – this time with tequila. Tequila martinis? No way! I had a hard time even imagining the concept, too. But fellow bloggers Caroline on Crack, H.C. from LA & OC Foodventures, John from Social Domain and I had a chance to give it a shot in celebration of and on the eve of National Martini Day – which was supposedly on June 19th. The setting couldn’t be better, either – from the rooftop of the Palihouse in West Hollywood. We warmed up with a spicy margarita, which was so unexpected yet had just the right amount of aftertaste. A tad tangy and not a plain hot. But the real treat was definitely the Maestro Dobel tequila martini (above). As you can see, it’s a clear tequila but apparently is still aged as it combines reposado, anejo and extra-anejo tequilas. Later, I learned the trick in this martini recipe – a touch of Cointreau Noir. Pour an ounce of Cointreau Noir into ice-filled Martini shaker then drain liqueur so it â€œsticksâ€ to the ice.Â Pour three ounces of Maestro Dobel, stir thoroughly, serve in classic Martini glass, garnish with orange twist and rejoice. 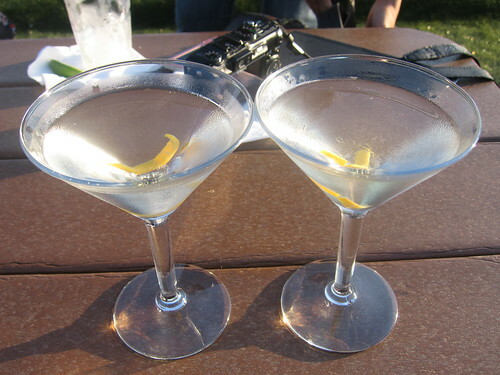 I thought the tequila did well for the martini – even as the color might have made me doubt at first. But indeed I did taste that it was an aged cocktail at heart and had good texture. The tequila itself isn’t cheap ($79.99 at BevMo! for a 750 mL bottle) but I could definitely taste why. And I could see why you could get away with this particular tequila in a martini – it’s aged yet clear. Delicious and potent. This entry was posted in West Hollywood and tagged maestro dobel, national martini day, palihouse, tequila martini. Bookmark the permalink.